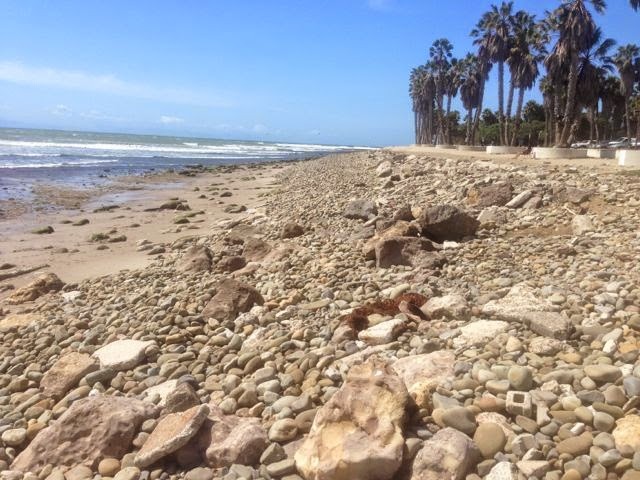 Over the last several years, severe erosion has become visible along the state beach at Surfers' Point and the Promenade. 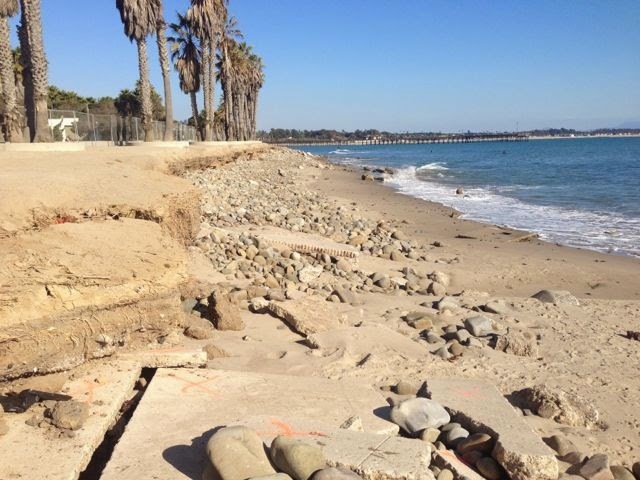 The loss of sand and beach is threatening the palm trees, the bike path and other City public improvements along an 800-foot stretch of beach. 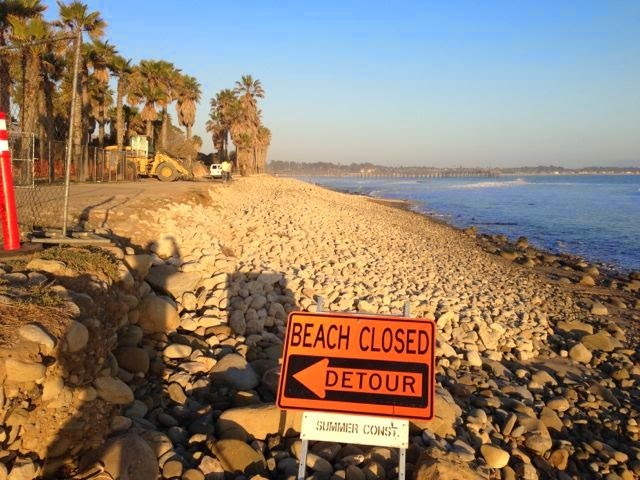 To restore and protect this shoreline and to prevent further erosion from occurring, it is recommended that the successful shore protection that was installed with the Surfers' Point Managed Retreat Project (2010) be extended easterly. 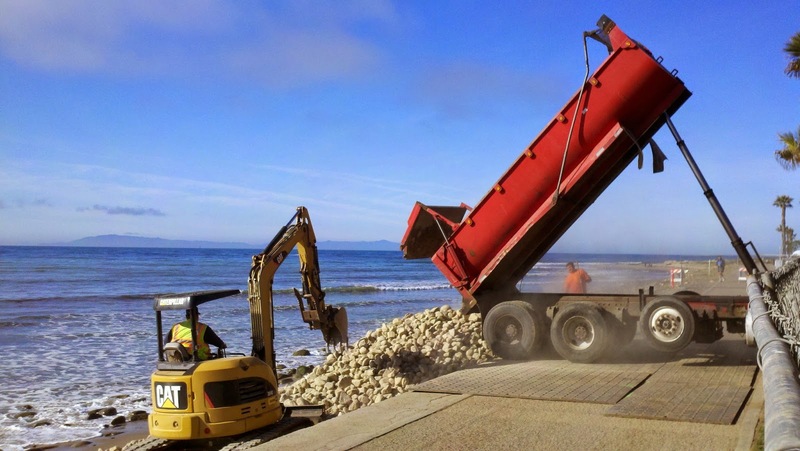 The complete nourishment of this stretch of beach requires the placement of an estimated 4,800 cubic years of small stone/cobble and 1,000 cubic yards of sand topping. In addition, existing concrete and other debris that is encountered by this work would be removed. 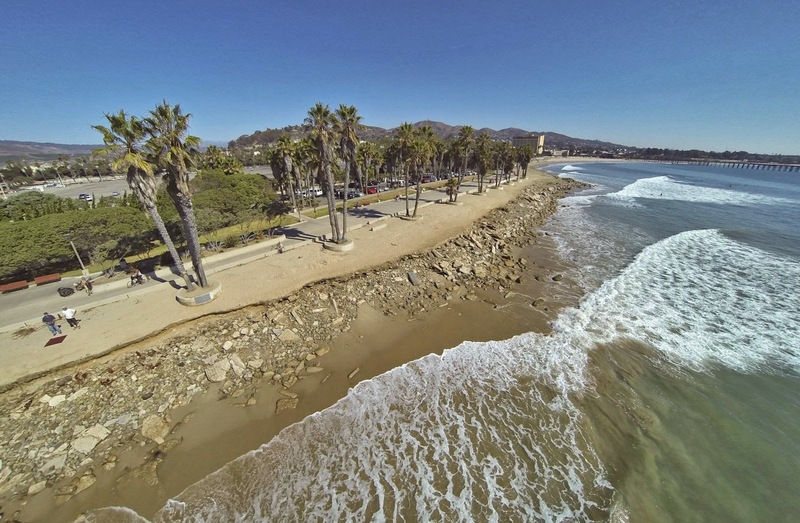 The improvements would effectively widen the beach along the bike path in this area by 10-feet and would protect the bike path and other infrastructure from costly damage. protection of existing public improvements. 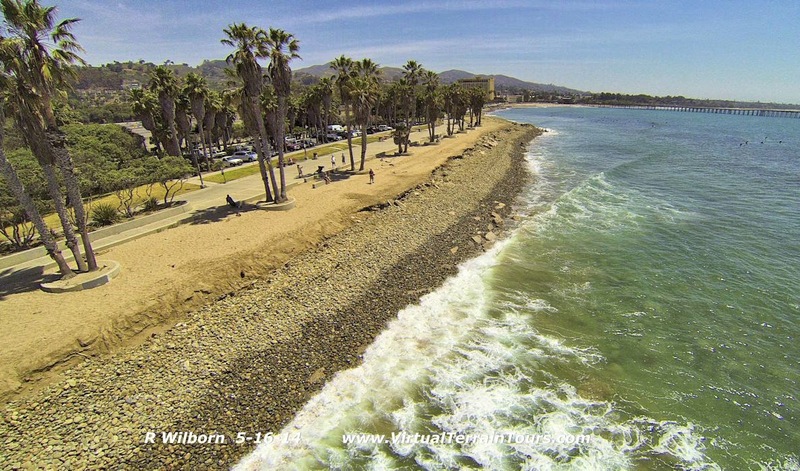 These aerial photos help illustrate the evolution of the shoreline following the construction of the cobble berm. The image above taken shortly following the construction clearly shows the downcoast extent of the constructed cobble berm and the concrete debris directly downcoast. 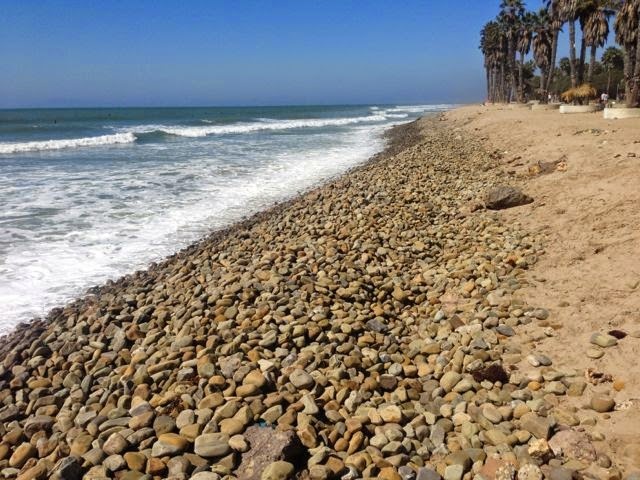 Although the site did not experience many large winter swells in 2014, the beach quickly adjusted to the new cobble berm. The image above clearly illustrates that by May much of the cobble had migrated downcoast, filling in on top of the concrete debris. 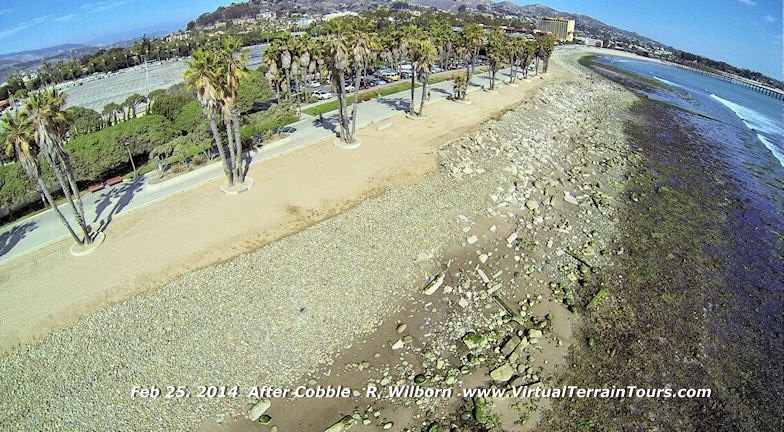 The image above shows how the cobble has migrated around the Figueroa St drain and into the cove. 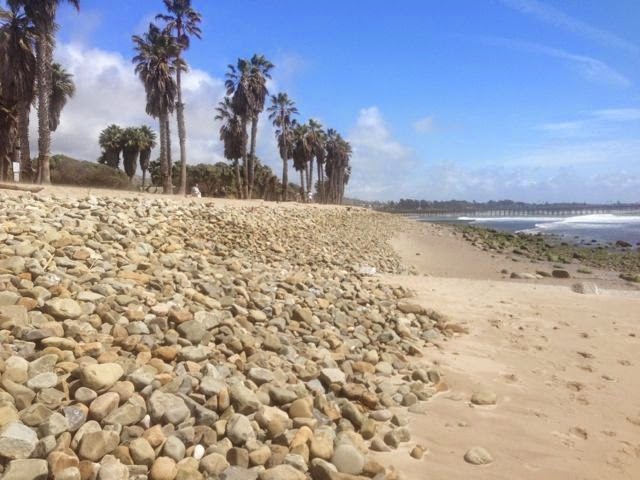 The cobble is evident in the photo below looking back upcoast from the drain on March 26, 2014 - note the relatively homogenous rocks filling in between the larger riprap from the constructed berm in the far background of the image. 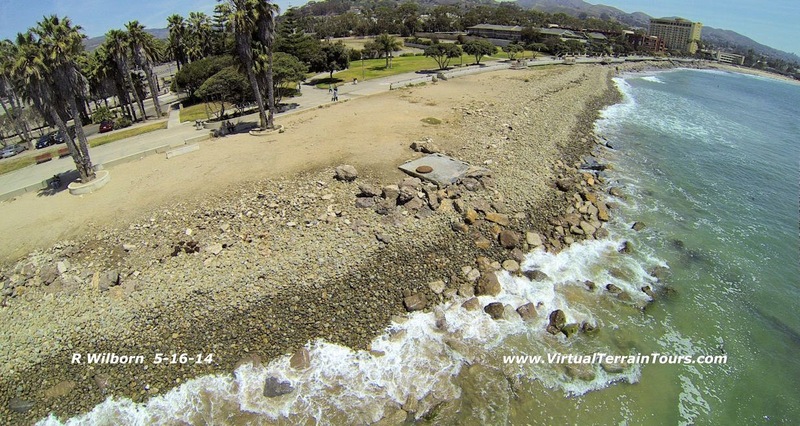 March 26, 2014: View from Figueroa storm drain looking upcoast toward cobble berm. Cobbles are migrating through the riprap toward the viewer.